So, Monster Hunter 4 is out now in Japan. While Capcom has admittedly had a hard time replicating the success of the franchise in the West, in Japan it's a sure thing, as a dedicated and monstrously large fan-base rarely hesitates to weigh-in on the latest entry. We'll give you one guess what'll be top of this week's Japanese charts when they're released. This game is of huge importance to the 3DS, then, potentially helping to establish its dominance even further in Japan. Early indications from Capcom suggest that this title may be exceeding even its own lofty expectations; the company has announced that over two million copies were shipped in the first four days — while shipped doesn't mean sold, it clearly indicates significant demand. Perhaps more importantly for Nintendo's own efforts to promote the eShop platform, Capcom cited that number as including download sales, and the game is already at number three in the all-time eShop chart for the region. We'll get an idea of solid retail sales in Wednesday's Media Create update, while we doubt Nintendo and Capcom will be shy of announcing eShop and overall sales in the coming days and weeks. If early demand is anything to go by, Capcom's target of 2.8 million sales by 31st March 2014 may get smashed. Major success in Japan will, hopefully, lead to localisation to the West; perhaps Nintendo will need to step in to assist and make that happen, as it seemed to do with Monster Hunter 3 Ultimate. For our money it's a franchise that deserves another chance in the West — combine a large worldwide 3DS userbase with the fact this is an all-new entry (not an upscaled remaster) and it could be a breakthrough entry. Whatever happens, Capcom's accountants will be happy today. Well. That's quite a number. The estimate seems kinda low when MH3G, a port, sold 2 million copies at a time the 3DS wasn't doing so well. Brand new game on the top selling system will smash that figure. So this a 3DS exclusive? I didn't even know that. The Wii U and 3DS versions have sold about twice this ammount(according to VGcharts in August), but in 4 days, not 2 years. I'd say Capcom will be printing money out of the 3DS for a while with this game. EDIT: That's assuming they will all sell, BTW, and they've already gotten at least .5 million sales if they're in the top 3 sellers on the eShop, already. Looking forward to seeing the next hardware charts! 3DS should see a rather nice boost for the next few weeks and in October with the Pokemon launch! impressive! Looks like the Monster Hunter Franchise ain't going nowhere! This game really needs to come to Wii U as well. Perhaps Nintendo's account system will be better when this game hits the west, and we'll be able to cross-play it more appropriately than MH3U. MH3U's system for transfers works, but it would be better if it was supported by Nintendo right out. @SCAR392 Either way, it needs to happen on Wii U, it would be crazy for the Wii U to miss out on a game like this, especially as quality exclusive 3td party games are not exactly plentiful at the moment. 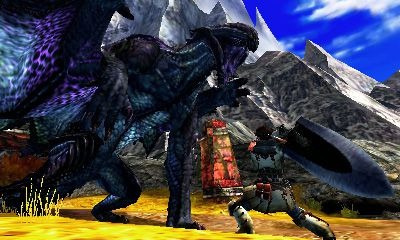 I get the impression that MU3U did quite well on Wii U and that was only really an HD update, so a new MH game should do well? @Peach64 Wasn't the 3DS doing pretty well in Japan during that time though? Monster Hunter 3G sold about two million in it's lifetime. MH4 is apparently selling two million in four days. So in the end it'll sell far greater than that. @cookiex Yeah, sorry, I should have been more specific. I was talking about capcom's estimate of 2.8 million by march next year seeming low. 2 million week one is very impressive. @Kasplat For me Monster hunter 4 was the reason to put some serious money down.. The reason for that is : Im still waiting for Monster Hunter 3rd for vita. I love Monster hunter 4 on 3DS but i want twin sticks so i bought that slide pro thingy, Works really well But you never know capcom. Maybe they will never release Monster hunter 4 here in Europe..
Let´s hope for a MH4 "Ultimate" on Wii U. Very impressive. Now, to try to get my friends that are in Japan to send me a copy (and an LL). I know I mention this, like every MH4 post, but still! Haha. Game looks amazing and I've been following it for quite some time, even though I won't be able to play it for another year, at least. I just started getting into mh3u; they can take their time. Actually, if capcom wanted to release an annual release of this game, that would be awesome. It's a killer franchise. This really makes me want to give MH3U another try on the Wii U. Great news, and Capcom really could use the cash income. We have NO IDEA how much hype there is for this in Japan! Imagine if 3ds sold 200, 000 consoles that weekinjapan as a result! Hurry up and bring to the west! @ricklongo I recommend that you borrow or rent the game then. The demo doesn't drive it home. This game looks so tasty! I love how interactive the surroundings appear this time around. Yep, that's MH for you. That's great news!!! I hope MH4 comes to other countries!!!!! This is great.. (remember a lot of third party games are struggling to get this kind of numbers.. and when I say that I mean 2 million in general on systems that still have twice the User Base.. so this is really good..) I wish they would reconsider bringing it to Wii U though.. MH is just a game that I cannot enjoy as much on the 3DS.. still fantastic numbers..
@Peach64 Yeah but I think that was monthly data for the "remake". This is data for 4 days or so, not the whole month. I agree that Monster Hunter takes some time to get into; it requires a huge time sink before you can decide whether or not to stick with it. That's how it was when I originally played Tri (my first monster hunter) it was rather tough to get into at the start (since you have very minimal gear and even a Great Jaggi can KO you that early if you have no experience). It takes awhile till it gets "good" so to speak. OOOH and people thought the 3DS was doomed, not anytime soon jerks. @oreqano Oh, I do own the game already. I traded my Arkham City: Armored Edition for it (yeah, I think I was one of the five people who couldn't enjoy that game). But it was around the same time as I got Pikmin 3, so I never gave it a fair shot. Seems like it's about time, though. And this was released on 3DS instead of Wii U...why? Ha. I also bought Pikmin 3 but haven't made it far because me and my wife play it together but she can't pull long stretches of gaming like me. May I suggest (if you haven't already) play online. Its such fun with a group and most are willing to help you with details you may not understand. @DerpSandwich In Japan the portable MH games sell much better, because so many people own portables and gather together to play them. @DerpSandwich Simply put, It's the perfect system for the biggest Monster Hunter consumers. 3DS is far more popular and convenient to Japanese life style since they all live so closely together and are on the go. You'll find that it would be silly for them not to, it really is the perfect marriage. Here in the States or honestly just about everywhere else due to how much more spread out people are compared to Japan and that we take the the time just to game; consoles tend to fair better to our lifestyle. Personally would like an HD version eventually, but for now just making it over to the rest of the world is my desire. I just figured they would try to use the power of the franchise to sell some Wii U's! Hopefully when they bring it over here they'll give us a meaty HD version. The Wii U needs some really graphically top-notch games. I am glad it is selling well, but for some reason, this has not won me over like Tri/3U did. I was super anxious for those, I am indifferent to this one. A console release might change that tho. @Peach64 Exactly, cause it doesn't "grab" anyone. You try it once or twice, get into the bigger fights, and it slowly converts you. When you start getting into bigger hunts like the infamous Rathalos or the Zinogre, you'll realize that no one should be without the never-ending grind that is Monster Hunter. Seriously, this s*** is good. I will seriously cry if this game never gets a proper US release. I wont hold my breath for a US release, but I will buy it day one. Just passes 300 hours in mh3u. @Cohort It'd probably be better to get a new and different MH for Wii U. I'm not so sure we're gonna see a Wii U port of this one, if only because the game will have online play, unlike MH3U on 3DS. That, besides an HD reskin, is all the Wii U port offered, so unless they decide on a MH4G (which, considering the franchise's history, they will), I just don't see it coming straight to Wii U as a simple port. @DerpSandwich Because it was specifically made for 3DS? Because Monster Hunter consistently sells better on handheld platforms? I think you're looking at it in reverse, as if Wii U should be their first choice. This is the first time a main, numbered entry came out on a handheld, but I really think that's more recognition of the franchise's strengths than anything. To specifically note your concern for graphically impressive games, an HD reskin of a 3DS game would definitely not show off the power of the hardware, hence my desire for something new and unique on the system. @cfgk24 ! Jeez! This came true! 270,000 3ds console sales in first mh4 week!. What will happen when kids are allowed a 2ds! @Hamguar Thanks for the info. Very informative. @DerpSandwich It would be a nice eventual bonus. I bought both versions and love the utility of both. @Windy your welcome, here's hoping that the great sales they are getting for Monster Hunter 4 will be well used.